S'mores, short for "some mores," is a traditional campfire confection made with graham crackers, marshmallow, and chocolate. The origin is unclear, but one recipe, named "marshmallow sandwich," was published in a 1920s Campfire Marshmallows recipe book. Since the sweet treats are traditionally assembled and cooked over a campfire, they are often associated with Boys and Girls Scouts. 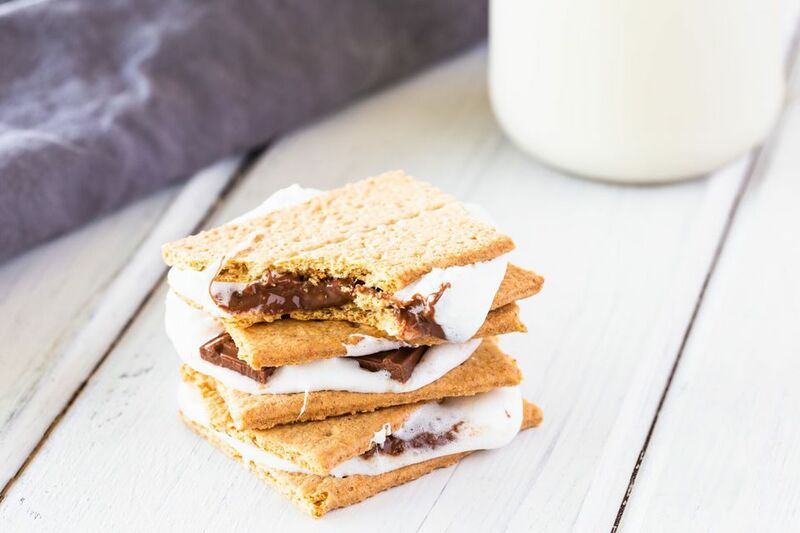 This is a classic S'mores recipe using graham crackers and chocolate bars along with marshmallows. However, the method of cooking is different. The marshmallows aren't toasted over an open fire, they're melted on the chocolate in the oven. All it takes is three ingredients and about 20 minutes of your time to make these treats that would be perfect for a pajama party. But don't forget about the adults—they would be great on a passed dessert tray with an encouragement to eat them while warm. Line a large baking sheet with foil or parchment paper. Break the whole graham crackers along the scored line so you have 48 pieces. Place 24 on the prepared baking sheet. Put 1 square of chocolate on each cracker. Place a standard-sized marshmallow on each piece of chocolate. Put the pan in the heated oven for about 4 to 6 minutes, or just long enough to melt the marshmallow and soften the chocolate. Remove the pan from the oven and place the other half of graham cracker on top pushing down slightly so it adheres. Serve while still warm and gooey. Instead of using milk or dark chocolate, try white chocolate or almond bark. Use a dollop of marshmallow cream in place of a whole marshmallow (decrease the baking time to 3 to 5 minutes). Instead of regular graham crackers, try the cinnamon variety. Use Oreo cookies or chocolate chip cookies in place of graham crackers. A mini peanut butter cup in place of a square of chocolate would be heavenly. Think big and make it a double- or even triple-decker dessert sandwich. While S'mores are baking, dip one side of the other graham cracker halves in melted milk, dark, or white chocolate. Transfer to a parchment-lined sheet pan and place in the refrigerator. When the S'mores come out of the oven, remove the chocolate-covered graham cracker halves from the refrigerator and place one on top of each for an even more decadent treat.